Santana was formed originally in 1967 in San Francisco, California. 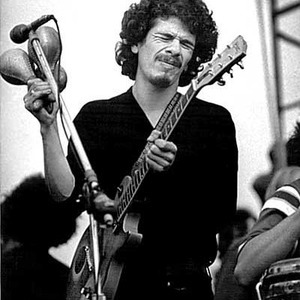 Carlos Santana is a Mexican-born American. Originally named The Santana Blues Band, they rose to international fame when they performed at the Woodstock festival in 1969. This led to their second studio album, Abraxas (1970), becoming a Latin-Rock standard and a huge critical and commercial success. Over the years their line-up has changed constantly, allowing them to evolve with the times. Over 50 musicians have been in Santana over its 40 year history, but the only constant has been Carlos Santana himself. Various successful bands have been spawned by Santana, most notably Journey, formed by keyboardist Gregg Rolie and guitarist Neal Schon, both key members of Santana's early days. Following a brief quiet period in the early 1990s, Santana returned to stardom by releasing two successful albums, Shama and Supernatural, featuring various guest vocalists. Santana's original drummer Michael Shrieve was one of the youngest performers at the Woodstock Music Festival in the year 1969 at only 19 years of age. Carlos Santana is known to use Paul Reed Smith (PRS) custom guitars, though his choice varies according to co-players. On his last album, The Best of Santana, he played a Stratocaster to match with Eric Clapton's Strato-style.